REDMOND, OR -- After 19 years as head of the Deschutes County Fair & Expo Center, Director Dan Despotopulos steps down this spring. He's worked in entertainment for many years, and says he's proud to have spent so much time in Central Oregon, "We've had almost 400 events a year - a whole variety of different events. So, it's just been fun. And the fair, of course, is the biggest event we put on and it's just been fun growing that event to the biggest county fair in the state of Oregon." He tells KBND News, "It's been fun, with all the support and community, all the different kinds of events we've been able to bring here. I think it's been good for the community, certainly the economic impact the facility has on the region from all these different events coming in." But, he says, it's time to retire, "I've been in the fair business here since October of 2000. But, prior to that, for 30 years, I was in the ice skating industry all the way back to 1971. I worked for the IceCapades for many, many years; I worked with Dorothy Hamill for a few years. I've got a long history in the nature of this type of business, so it's just time." Deschutes County Commissioners are actively searching for Despotopulos' replacement. "My last day of work now is going to be May 31st. So, basically, three more months. Or, it could be sooner if they find their suitable replacement that they're looking at through their recruitment process." Some of the events Despotopulos will oversee before he retires include this weekend's Central Oregon Sportsmen's Show, the national FFA convention, state middle school basketball championship and monster trucks. 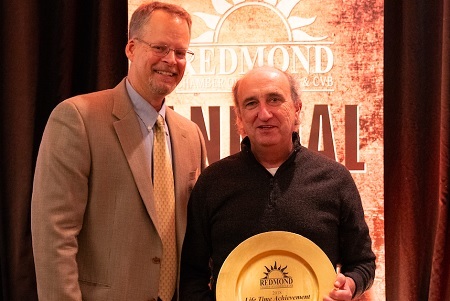 Photo: In January, Despotopulos was presented with the Redmond Chamber of Commerce Lifetime Achievement Award, by Chamber Executive Director Eric Sande.